I've had my eeros for a few days and they seem to be working well. I have a question though. 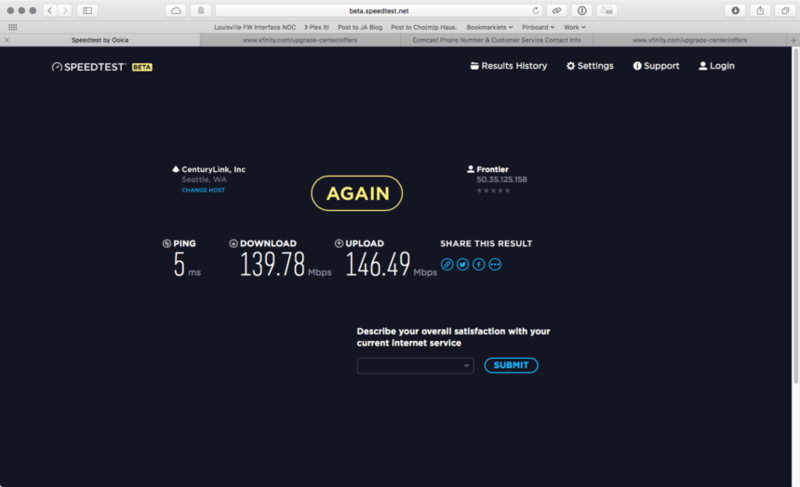 I've got Comcast that is nominally 150/10 Mbps. My modem is an Arris TG862G-CT in bridge mode. I have three eeros. The first is connected to the modem with a cable. The others are just WiFi. If I connect to the modem via ethernet a speed test (from speedtest.net) reads 180/12. If I connect to the furthest eero via wifi and run the same test I get between 50/12 and 100/12. That all seems good. 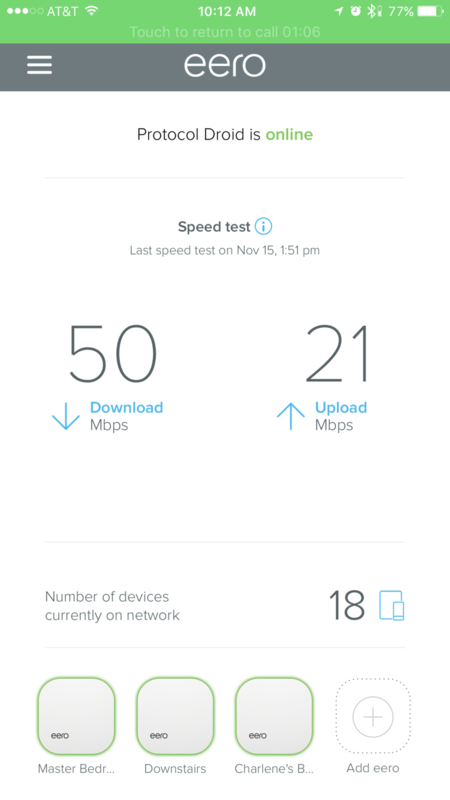 The odd thing is that the speed test in the eero app consistently says between 32/12 and 37/12. It was reading about 50/12 before I switched the modem to bridge mode. I don't understand why it's so different to an external test, or why putting the modem into bridge mode changes it. 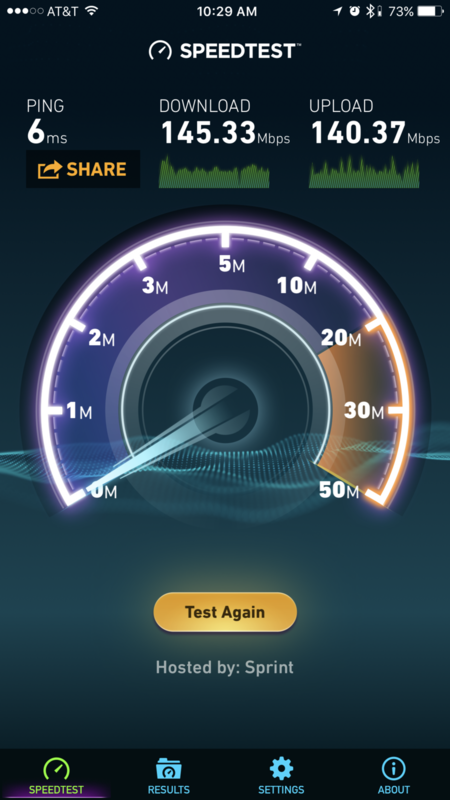 Yea the speed test in the app has been horribly inaccurate for several months now. A general consensus is to just ignore it. Hopefully they'll just remove it from the app soon as it takes up a lot of screen space. That's fair. It would be fine by me if it went away. It's potentially useful if accurate, but annoying if not. The modem shouldn't really affect this test. It's likely just a few tests that occurred during a time when the traffic was much lower. They are aware of the inaccuracy of this test. Personally I would rather have a piece of useful information populate that main page vs that test. If we could select the test and destination then maybe it would be more helpful to be able to compare wireless client vs the Eero connected to the modem. I think one thing that would make this better is the ability to set a time for the speed test to occur. Right now, it seems to pick a time of the day and it sticks to that time no matter what. Or something. If someone is streaming a video call, for example, the speed test will reflect that, so it might show artificially low. It seems to depend on what else goes on on the network. So - if I could tell it to speed test each night at 2AM, I think it would give you a more accurate idea of what your bandwidth actually is. Ongoing issue. I've noticed that the speed test results from Eero were significantly different than the results from my computers throughout my network. I recently changed ISPs, and have again validated this. My service is 150mbps symmetrical. I have a slightly different angle on this thread. That is that I think it would be a valuable feature to determine if my ISP is providing the service levels I am paying for. Basically a ~pingdom metric that would calculate average/95th percentile of my ISP bandwidth I'm getting to my modem. Along with downtime. For example, if Eero could sample every ~5 min and report my ISP Service Level over time, for last week, month or whatever. I agree that the user should be able to set the time of the daily internet speed test. My main interest is what my internet speed is during prime time in the evening. Like at about 9PM. This is the slowest speed that I get, and it would be useful to get my internet speed then. Right at the moment, it's giving me the speed at 1PM, and I know what that is, that's the full speed that I get from my ISP. Anyways, kind of disappointing that I can't seem to influence the time that this test is made each day.